The Ocean Acidification Monitoring and Mitigation project (OAMM) is a public-private partnership between TOF’s International Ocean Acidification Initiative (IOAI) and the U.S. Department of State. 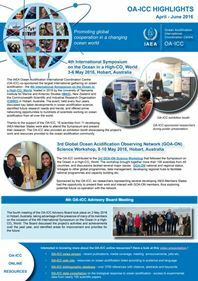 OAMM engages government, civil society, and private stakeholders on building capacity of scientists in the Pacific Islands and Latin America and the Caribbean to monitor, understand, and respond to ocean acidification. This is done through regional training workshops, development and delivery of affordable monitoring equipment, and provision of long-term mentorship. The scientific data produced from this initiative can ultimately be used to inform national coastal adaptation and mitigation strategies, while promoting international scientific collaboration through the development of regional monitoring networks. The Ocean Foundation (TOF) is seeking a workshop host for a training on ocean acidification science and policy. Primary venue needs include a lecture hall that accommodates up to 100 people, additional meeting space, and a lab that can accommodate up to 30 people. The workshop will consist of two sessions that will span across two weeks and will occur in the Latin America and Caribbean region in the second half of January 2019. Proposals must be submitted no later than July 31st, 2018. The Ocean Foundation, 5 July 2018. More information. 4-22 June 2018 at the Sven Lovén Centre for Marine Infrastructure, Kristineberg, Fiskebäckskil (University of Gothenburg) in Sweden. The advanced training was led by Dr. Sam Dupont, and included 15 participants from 15 different countries. The course was designed to give trainees some choice over which subjects they would like to focus on, and included conducting several biological experiments, proper water sampling, field work, carbonate chemistry analyses, and lectures. By having a longer and more intensive course, participants had the opportunity to network as well as troubleshoot any issues that arose in the laboratory. As an outcome of the course, the trainees will collaborate to write and publish a paper together. The design of this capacity building effort provides a tangible outcome for the course’s participants and provides a concrete contribution to global understanding of biological ocean acidification impacts. Support for one participant was also provided from The Ocean Foundation. Deadline for applications: 2 July 2018! Topics will cover the geological characteristics of this unique active volcanic area, its bioligical components adapted to natural ocean acidification in the local vent systems, and hydrothermal fluid characterization. Participants will be trained in multi-parameter monitoring techniques and definition of experimental protocols for the sampling and study of the planktonic and benthic ecosystem, with special focus on assessing effects of climate change and ocean acidification in organisms, communities and habitat. The first of two webinars to discuss the role of citizen scientists in ocean and coastal acidification (OCA) monitoring. During this interactive webinar, the value of OCA monitoring, commonly measured parameters, and how to align OCA research hypotheses/monitoring with existing monitoring efforts will be discussed. Space is limited. 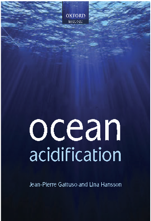 This graduate level course introduces students to the theory, methods, and techniques needed to conduct successful experiments on the biological effects of ocean acidification. Through a combination of lectures, laboratory exercises, and field work we will prepare students to perform ocean acidification research at their home institutions and in other settings.